Capcom has just released their newest Action RPG: Dragon’s Dogma. 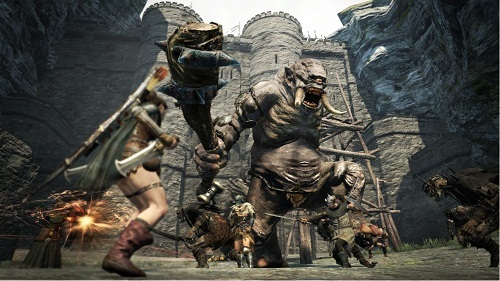 Dragon’s Dogma is a very unique game, borrowing various elements from successful RPGs. Its combat style is similar to that of Demon/Dark Souls with a hint of the classic PS2 Shadow of the Colossus. It also has a hint of MMORPG thrown in with the way parties are created. However, it borrows more than just elements from Dark Souls. This game is very difficult and unforgiving. But, that isn’t necessarily a bad thing. Let’s get into the specifics. Dragon’s Dogma is a medieval RPG. This means you will be hearing a very old English dialect. The story is based around a dragon who stole the main character’s heart. However, the main character was able to live, and now seek to regain his heart. The story meshes very well with the scenery, which allows the player to become easily engrossed. However, the story isn’t exactly Pulitzer Prize winning material, but it isn’t bad. Dragon’s Dogma isn’t very story driven; the focus is more on the exploration and gameplay. The graphics are very impressive, especially on seven-year old hardware. There is no shortage of breathtaking backdrops and detailed character models. The graphic style is very similar to that of Skyrim or Skyward Sword. Additionally, the animations are incredible. Various fights have you climbing atop monsters to attack their weak points; and these animations are amazing. The music is well composed and is an incredible soundtrack to your epic adventure. There is enough variety to ensure the soundtrack never gets stale, and the music is enjoyable to listen to. The voice acting is very well done. There is nothing worse than playing an RPG and hearing terrible voice acting. The gameplay in Dragon’s Dogma is very visceral and rewarding. Combat is very fluid and fast. As I said before, you will often be able to climb onto the monster to strike at their weak point. This feels incredibly rewarding and gives the player a sense of power. At the beginning of the game, you choose a basic class: Mage, Fighter and Strider (an Archer). As you continue through the game, you unlock more advanced classes and there is a true sense of progression. This is not one of those games where you just hit harder/faster as you continue; you gain many spells and skills as well. The controls make perfect sense on a controller, nothing feels out of place. The most unique feature of Dragon’s Dogma is the pawn system. You can add other player’s characters to your party, who are then controlled by NPCs. This gives it a pseudo-MMO feel to it, which is very nice in an action-RPG. The gameplay in Dragon’s Dogma is incredible, and is what will keep you coming back for more. 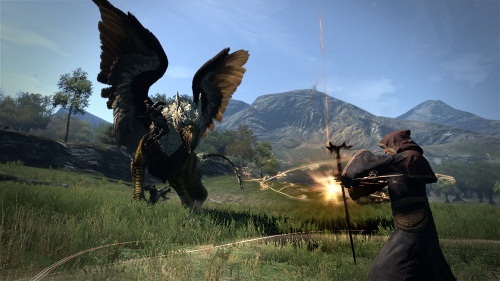 A combination of the amazing setting, graphics and controls make Dragon’s Dogma incredibly immersive. You can easily put yourself in the shoes of your character, and you become attached to your teammates. Due to its amazing controls, incredible class system and its MMO elements, Dragon’s Dogma has amazing replayability. There will always be something new for you to experience, playthrough after playthrough. Dragon’s Dogma leaves a lasting impact. Action RPGs are often hit or miss. However Dragon’s Dogma hits the mark perfectly, while the story may not deep, the combat more than makes up for it. Dragon’s Dogma is enjoyable and engrossing, you’ll find yourself spending hour upon hour searching for that next haul of treasure, or the next epic monster. I recommend this game to anybody who enjoys Action RPGs. Dragon’s Dogma is one of the best titles that have been released this year.